Guys! I made dinner! Its been such a rare occurrence these past few months that I knew I had to document- well and that this dinner is totally worth blogging about. 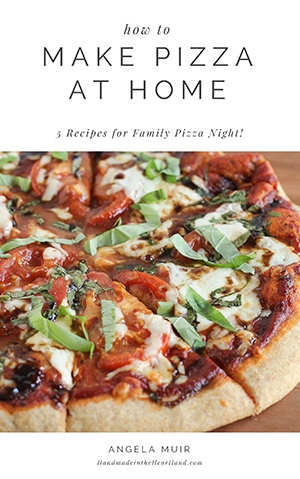 Its easy, includes a vegetable and comes together in 30 minutes with very few ingredients. What more can you ask for? Oh and because it includes smoked sausage, that to my kids look and taste very similar to hot dogs, they ate it. 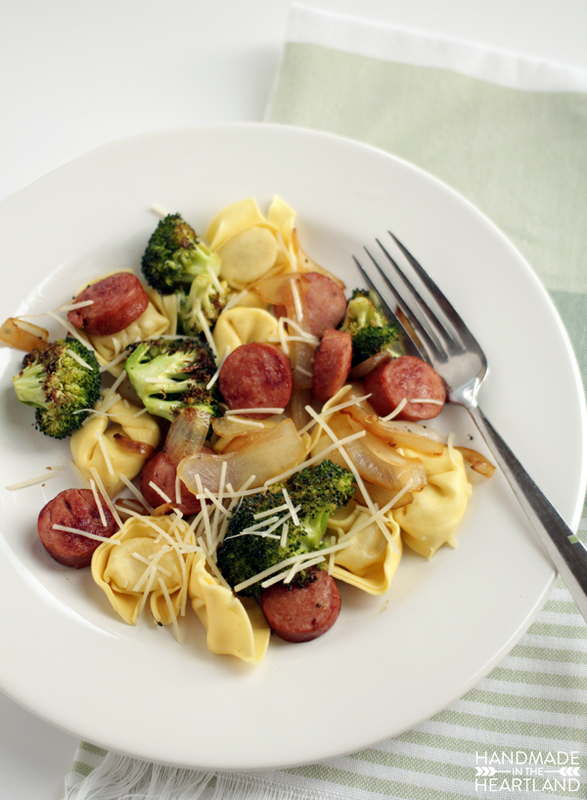 Ok maybe they just picked out and ate the sausage and tortellini, but still I didn’t have to make a separate dinner of well, hot dogs. 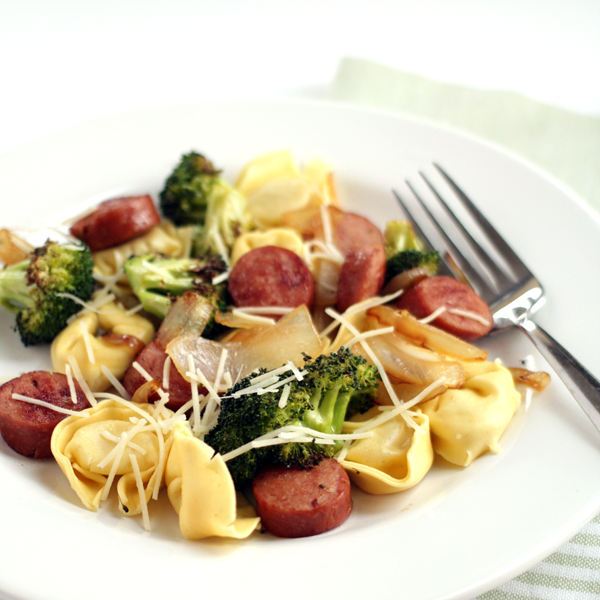 You totally need to pick up the ingredients for this roasted broccoli and sausage tortellini next time you are at the store- you’re gonna love it! Can we talk for a second about roasted broccoli? I’m as much of a fan of broccoli as the next person- which is I don’t love it to pieces but I know its good for me so I eat it. Friends the answer is roasting. ROAST IT. high temps plus veggies equals goodness. I promise you’ll love it ten times more than you like it steamed. seriously. I love the combination of the roasted broccoli in this dish with the good and almost caramelized onions. yum. Oh and if you’re not roasting vegetables with a Silpat, get one! Read about the top 3 reasons I love my Silpat! Preheat the oven to 400. Cut the broccoli head into florets, discarding extra stems. 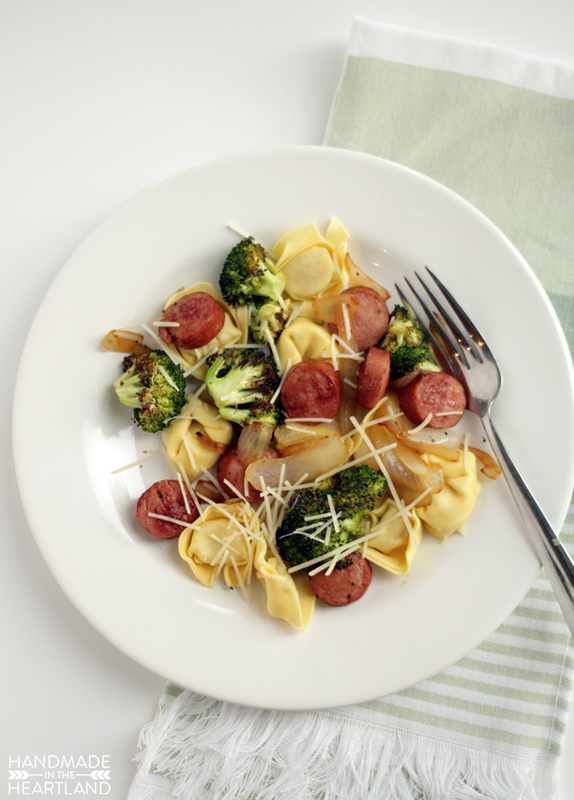 In a bowl toss the broccoli with 1-2 tablespoons of olive oil and a teaspoon of sea salt. Spread on a Silpat lined baking sheet and pop in the preheated oven. Roast for 20-30 minutes. You want the broccoli to be charred in spots. Meanwhile, In a skillet over medium heat add a tablespoon of olive oil and add the chopped onion. The onion does not have to be diced small, just roughly chopped will do. Cook the onions until translucent and starting to brown in spots, probably about 10 minutes. In another pot cook your tortellini according to package directions. Once the onions have browned add the sausage, which should be chopped into 1/2 inch pieces. When you add the sausage let them sit for a minute or two without stirring to allow them to brown and crisp on one side, then stir and flip sausage to the opposite side. 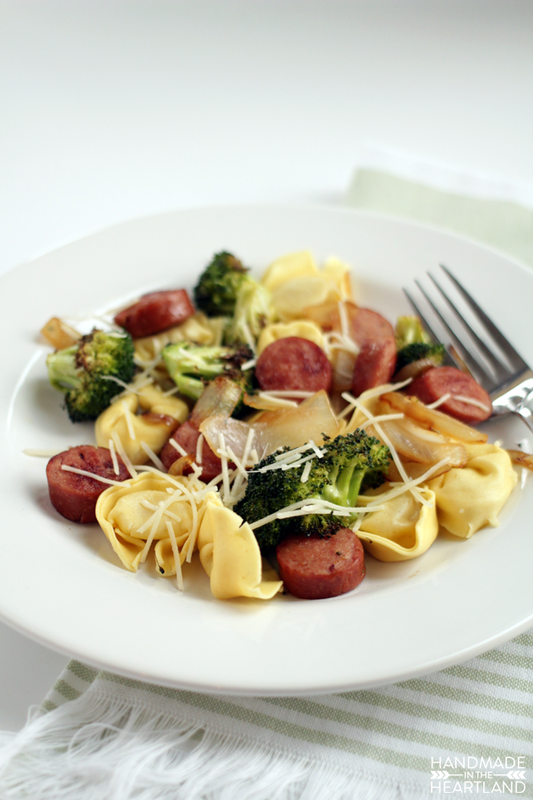 At this point your broccoli should be roasted, your sausage should be nice and browned in spots and your tortellini should be cooked. Drain the pasta and then combine all the ingredients in a bowl and toss it together. Serve immediately topping with shredded parmesan cheese. Enjoy! 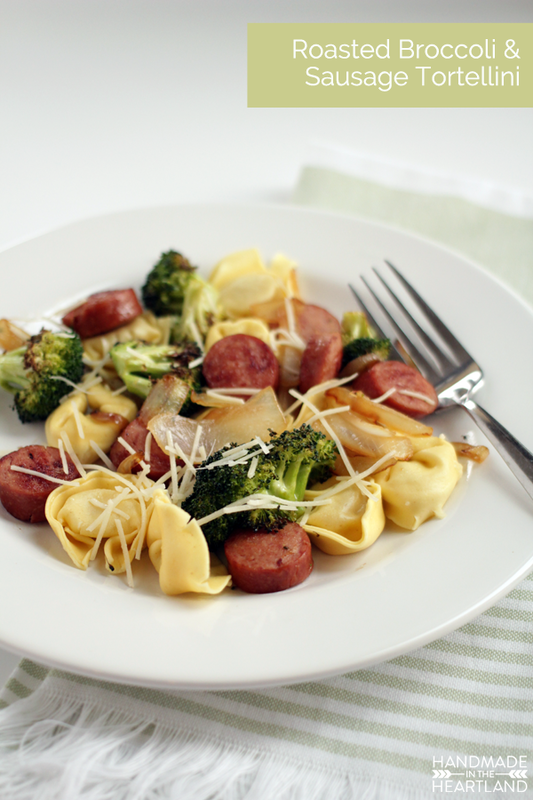 This dish is totally worthy of being put into your monthly rotation. Like I said its simple, fast and tasty. Let me know if you try it- I’d love to hear about it on instagram (@handmadeintheheartland) or in the comments! Bon Appetit!